My Memorial Day weekend started off with a bang at Yankee Stadium Friday night, where Mr. T and I watched them beat the Indians 8-2. Of course I missed the Robinson Cano grand slam. I just had to use the bathroom at that very moment and I missed it. It really never fails- that stuff always happens to me. To make up for it Mr. T got me a nice big McSorley’s and a hot dog at the game. 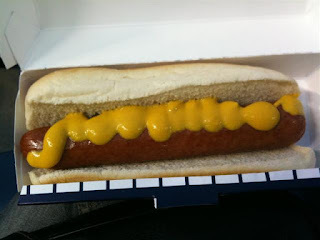 The dog was just your standard Nathans but such a better choice than my cheese steak last time. Games are meant for hot dogs…and didn’t he do a nice photogenic job of putting the mustard on! Oh and yes- they had full flowing kegs of Goose Island and McSorleys. Apparently they learned that people really like these beers and they were fully prepared to stay in stock unlike last time. The rest of my weekend was filled with friends visiting, multiple brunches, lots of beer drinking and just relaxing on the roof. I came back to work Tuesday not quite happy but a little refreshed. I happen to be downtown so I walked over to the Lobster Place in Chelsea Market to grab a spicy tuna roll for lunch. 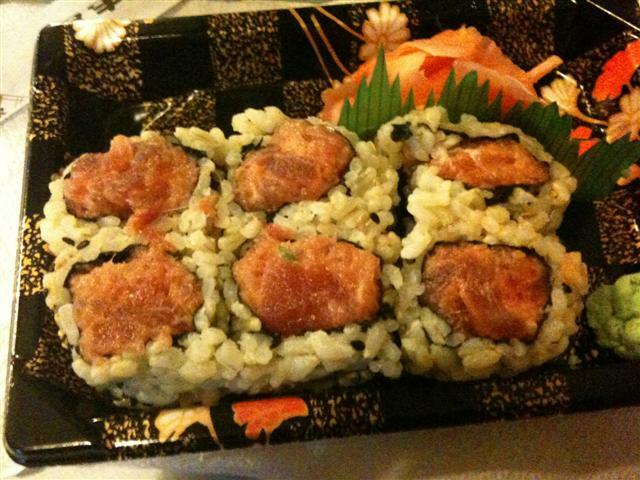 I love the Lobster Place because they are truly inexpensive, fresh and make sushi with brown rice if you ask. However Tuesday things were a little off. My roll was very texturally strange. Half of the roll was super chewy, almost stringy and the other half was like a mush. Now it was a Tuesday not Monday, but maybe after the holiday weekend the freshness rules don’t apply? Who knows. I’m still going there as a lunch spot but next time I’ll rethink an early week sushi buy. I’m heading back to Yankee Stadium tomorrow for their day game vs. the Orioles. Hot dogs and beer here I come!